Several gaming news outlets are reporting on the recent gaming outages brought on by a DDOS (distributed denial of service) attack (PCGamer, Joystiq, VentureBeat | GamesBeat) perpetrated by a group calling themselves Lizard Squad. This all came to a head when the SOE (Sony Online Entertainment) President’s plane was diverted due to a bomb threat made by the same group claiming responsibility for the DDOS attacks (Gamespot, Polygon). I’ll be following this story and making updates on it as it progresses since the FBI is now involved due to the nature of the bomb threat. Were you affected by the outage? Feel free to comment or contact me to let me know about your experience. My laptop only has a 750G hard drive which is quickly filling up. So, I spent all weekend cleaning it up and moving files to my Mac Mini server. One of my biggest headaches is my photo and music libraries. I’ve had iPhoto and iTunes since they existed. (The first iPod was a portable firewire hard drive that also played music! I couldn’t pass that up. I’ve also been taking digital photos since digital cameras came onto the market, which means I have tons of pictures.) This has lead to my libraries growing wildly rampant and becoming totally out of control. 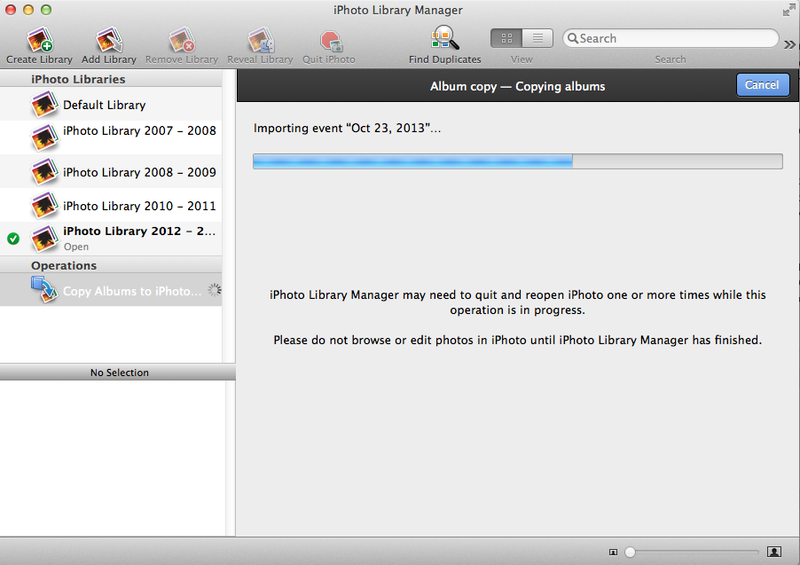 I also wanted to break up my iPhoto library into smaller ones so I could archive parts off. 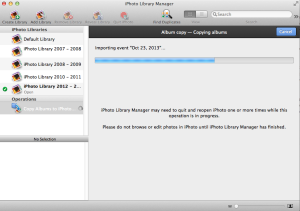 While splitting up over 20 thousand photos and videos has taken a long time – it’s totally worth it. Next on my list will be to tackle my resources library. I think I’m finally going to bite the bullet and buy Adobe CC education edition while I still can. Then I’m going to use the updated Bridge to organize my my 15gb of digital resources. If you have any other recommendations for organizing digital assets locally, please leave a comment! My readers, please take a moment to read all of the TOS in every single social app you have downloaded and used over the last year. This includes all of the updated TOS you automatically agree to because you’ve already had it installed. They ALL ask for some setting you’re not going to be comfortable with if you are caught up in the hysteria over the new FB messenger application. If you are not installing the FB messenger app because of the latest and greatest in sensationalist headlines, then you should follow through and uninstall every single other app that utilizes any of your social networks (twitter, tumblr, instagram, skype etc). After you’ve done that, you should revoke all access of those applications to each other (i.e. any app that is connected to your Facebook account). Then, if you really want to protect your privacy, you will delete your Facebook account altogether, along with every other social network profile you’ve ever created. Just don’t forget those companies still own all of the data you gave them over the last 10 years (if you’ve been on FB as long as I have). You already sold it to them when you signed up and they can do whatever they want with it whenever they want to. Most importantly, it’s their business to do just that. It is accessible via Facebook Settings (easiest way to access it is to click on the lock in the header next to the updates icon and go to “See more settings”). Mashable did an extensive writeup of the case here. In summary, two 12 year old girls claim to be bullied by another girl through social media. This bullying then escalates to attacks via their very own phones, computers, and network as well as physical stalking. It’s a chilling read. 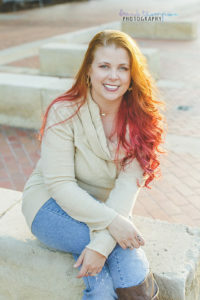 It becomes more than simple playground bullying when you are told what you are wearing and where you are located in your home by someone who is taunting you via social media. A big issue is many law enforcement agencies, especially those in the more rural parts of the country, still have no idea how to handle these cases. There needs to be some sort of organization these people can turn to in order to educate themselves and understand how this type of bullying effects those involved. Additionally, they need to be able to have quick and reliable access to people with technical expertise than can attest to the level of effort the attackers have gone through to carry out their maliciousness. Does any such program exist? If it does, who funds it and where is it located? If it doesn’t, why not? Hello? Facebook can hear you now. Last week several news organizations including Ars Technica shared information about Facebook’s new passive listening feature. This means if you use Facebook on your mobile device, you should take notice in the coming weeks and choose NOT to use this feature if you are not comfortable with it. Many of us are used to just bypassing these sorts of pop ups without a second thought. This is one you may want to pay attention to before you agree to it. Do you have or know someone who has an iPhone or iPad? If you or they live in either Australia or the UK, here’s a heads up. Make sure your device has a 4 digit passcode and back up your data to your computer. Secondly, enable multifactor authentication. Otherwise, you may end up losing it to a hacker who has hijacked your iCloud account. How often do you use your email? Your Twitter / Facebook / other social media accounts? Your cloud apps? What would you do if you lost it all? What is recovering it worth to you? When we have something of value, it becomes a target. And, the more we entwine our lives with technology, the more valuable those 1s and 0s become to us. Though cyber extortion is not new, it is interesting how common it is becoming. The latest attempt I recently read involved the loss of the @N twitter handle, which was facilitated by both PayPal and GoDaddy. Then there is the case of Hunter Moore who was arrested and indicted by the FBI for his involvement in hacking private email accounts to gain access to explicit pictures that were meant for private use only. While this was not exactly extortion, it was a method of hacking and stealing of personal digital property that was used to shame and make money off of unsuspecting people. Last year the story making the rounds was about Cryptolocker hijacking people’s data and then requiring money to unlock it and regain access to it. Then there was of course the great Facebook, Gmail, Twitter hack I wrote about in December. This is by no means an exhaustive list, rather just one to show the different ways your data can be used against you. What does this all mean for you? It should heighten your awareness of cyber security and the very real threats that exist out there today. How do we mitigate these threats? We do what we can to protect our data. Following is a simple list of steps you can take immediately to avoid becoming a victim. This means not only data you physically have access to like your financial documents, family photos/videos, or your music – but also your online presence. Many social networks let you download the entire contents of your user profile. You should also consider redundant backup options such as physical backups and off site backups. Just remember to make sure both are secure. Facebook, Gmail, Twitter, Paypal and more utilize 2-factor authentication. My first introduction to this was using an authenticator for my World of Warcraft account, which I opted for as soon as they were made available. I still use 2-factor on that account today. This Life Hacker article has a great rundown of all the places you should enable it. Do it now! While sites may require you to provide a birthday or email address, the also usually give you the ability to keep this information private. Those who need to know the year you were born or your private email address already have that information or can ask for it. There is no need for it to be out in the open for everyone to see. Also, don’t let sites save your credit card information. While it is an added convenience, as the case of @N above demonstrates, it can be used against you. Other advice he offered in his article was to call your institutions and require them to NOT share any of your personal information over the phone. That means birth dates, names, or partial information like last 4 of social or credit cards. This may sound odd as the whole allure of the internet is connecting with strangers. However, if you don’t know someone, you should be very cautious about letting them into any social network circle where they can find out more information about you as this can be used against you. Don’t click on anything you can’t easily identify. Don’t submit information to sites you are not familiar with. Don’t trust things just because they come from people you know. Don’t download things to your computer without some sort of software protection installed. In summary, treat your digital property much like you would treat your physical property. Follow the Hide Lock Take philosophy. It works for both your email and your car. Being the 2-factor security person that I am, I know many of you have probably read about Facebook, GMail, and Twitter passwords being hacked. Though you can’t do much about that (other than not have accounts with those services of course), there are steps you can take to keep those accounts secure even if someone else has your password. All that is required is that you have a mobile phone and that you set it up from your computer (I don’t know of a way to do this from the mobile side only). Facebook users, to enable the 2-factor setting click on the lock icon and click on the link at the bottom that says “See more settings”. Once there, click on the Security link 2nd from the top on the left. Then click on Login Approvals. There you will be given a checkbox to “Require a security code to access my account from unknown browsers”. You can check that box and then choose which method you use to get your codes. I chose the code generator because that will work even if I only have access to WiFi, whereas receiving a text message may not. I would also at this time generate extra codes just in case you lose your phone. Save them in a place that will be easy to access, so you can get back to your account easily should you need to. While you’re in the security section I would also suggest you check the active sessions and recognized devices. End activity on anything you don’t recognize. Lastly, setup your trusted contacts. Be sure to choose people who actually use Facebook regularly. 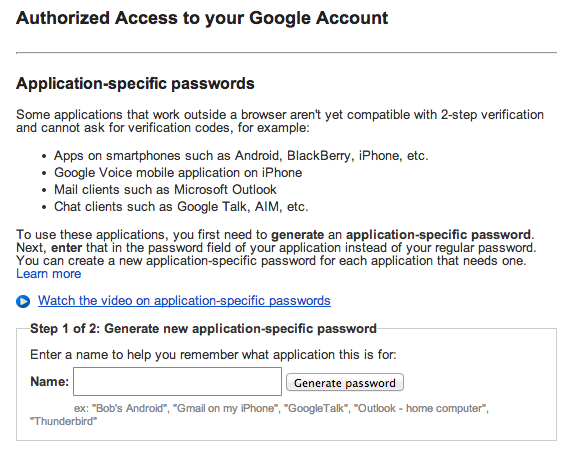 GMail users who use their accounts on multiple devices may find this method a bit cumbersome, but it’s only cumbersome to setup. Once it’s done, you don’t have to make any changes unless you get a new device or wish to disable it. Login to your GMail account and then find the cog icon under your picture on the upper righthand side of your screen and click settings. 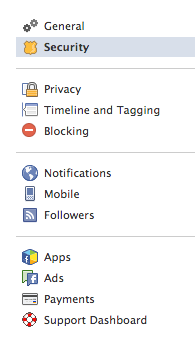 Once there, click Accounts at the top and you will find security settings. Clicking Account Recovery Options lets you set up your phone to use to recover your account should you forget your password or to challenge hackers. You can also add a recover email address as well as an alternate email address you can log in with. I would highly suggest doing both. 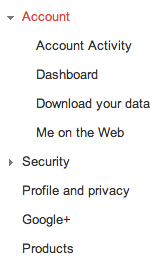 Clicking Other Google Account Settings will take you to a page that lists all of the settings for your Google identity. If you’ve never been here, I suggest you read it so that you understand more about the way Google views & uses your information. For our purposes today, click on Security from the menu on the left. From there, scroll down to the bottom to find 2-Factor Authentication and turn it on. After you set it up, you will want to create device / application specific passwords for your account so that you can log into your email through your phone, tablet, or other device that doesn’t use 2-factor authentication. You can click on the link visible in the screen shot above to get there. Pro-Tip, you can use one generated password for all of your devices if you enter it into all of them at the same time. Caution though, if you do that and have to revoke it for some reason (you lose your phone), you’ll end up revoking it for all devices instead of just that one. 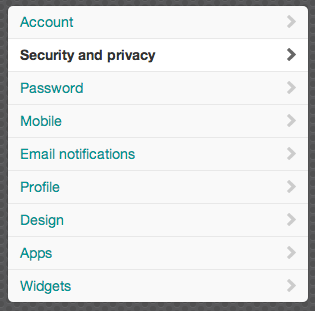 Login to Twitter and click the cog icon on the top right hand side of the nav bar. Then select settings from the menu. 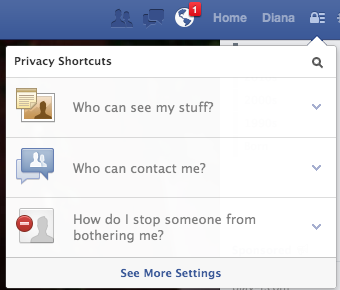 Then select Security and Privacy from the menu on the left. 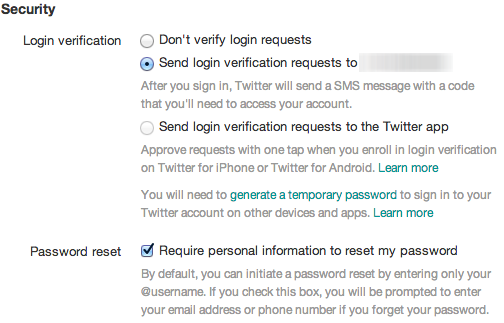 Then select one of the two login verification options available. Hopefully this was helpful to some of you. I know these settings can seem buried and intimidating if you’ve never used them before, but I suggest it is worth it to go through all of this trouble so that you don’t end up losing your digital life to someone else’s malicious activities.